Have you seen it? So cool! The deal is, it’s an attempt to illustrate Barbara Walker’s stitch pattern treasuries with full color photos in a searchable database. If you have the books and want a better view and maybe a little opinion on a certain stitch, you can look it up online. People have to knit all the swatches and take the photos, so if you think it sounds great, go join up! I donated a swatch of Chain Link Cables from The Fourth Treasury of Knitting Patterns. Difficult Techniques: Requires 2 cable needles. It’s the one I used in Mr. HelloYarn’s gansey and my favorite cable EVER. That’s a wonderful cable that I’d never noticed in the treasury before. Thanks! Its funny – I just saw that post over on the WTP site, and immediately thought of you and that sweater! It didn’t even register that you knit it! I love the intricate cabling! And the Walker Treasury Project is TRULY ingenious. I honestly never really stopped to think about contributing a swatch of my own, but why not? That’s very cool! It’s nice to see those patterns recreated in color, and with more detail. That is a gorgeous, meaty cable. This reminds me of the Julie and Julia blog, where someone tried to do all the recipes in Julia Child’s “Mastering the Art of French Cooking”. wow, you actually used it in a sweater. its very striking. These are beautiful cables, I’ve never seen them before, I think I will have to use them in some way! 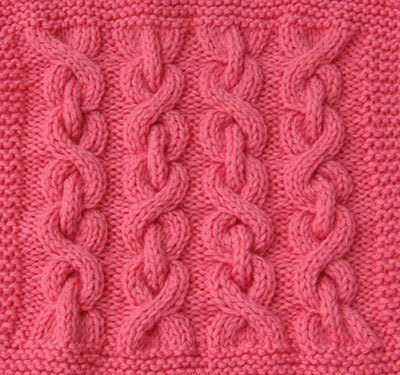 What a beautiful cable pattern! It looks great on the sweater. That is absolutely beautiful! I’m not sure how I missed it before, but it looks great in that sweater! Thanks for the link! I think this project is so innovative and really demonstrates the community aspect of online knitters. I love your swatch! Those are some big, beautiful cables!